Do you want to grow your email list this year? If so, then adding an opt-in box to your website is just the tip of the iceberg. 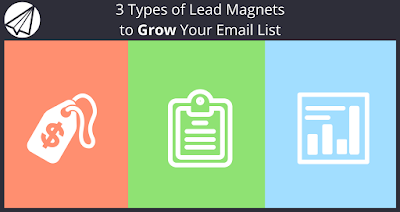 To really grow your email list, you are going to need a lead magnet. A lead magnet is simply a free digital goodie that you offer in exchange for your website visitor’s email address. Depending on your website and your business, it may take just one minute to one day to create create yours. 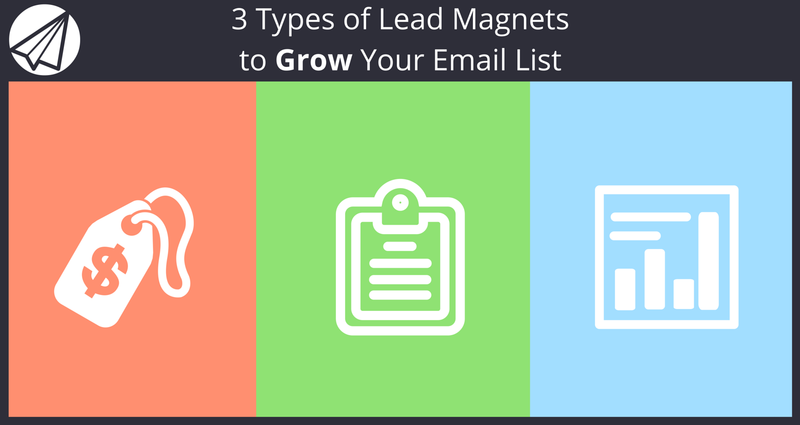 In this post, we’ll share with you our favorite types of lead magnets you can use to start growing your email list today. Are you an online retailer that sells products online? If so, then a discount code is going to be the easiest lead magnet to add to your website. Simply add the code to your shopping cart software and tell visitors they will get an immediate percentage off or free shipping discount code when they subscribe to your email list. Then add that code to the thank you page that visitors go to after they submit their email address, add it to the confirmation page that new subscribers go to after they confirm their email address, and add it to the welcome email new subscribers receive once they’ve confirmed their subscription. This lead magnet works in three great ways. First, it gets people on your email list, so if they don’t buy now, you can sell them something later. Second, it gives them a reason to shop now because they have an incentive. Third, it gives them a reason to shop later as they will see that discount code again in their welcome email. Let’s say that you don’t sell products online. That’s ok. Now you can tap into the world of free information. The fastest thing to create is a free checklist. Just think of two things: who do you want subscribed to your email list and what task could they use a checklist for? These answers should ultimately relate to your ideal customer and the product or service that you sell. For example, let’s say that you offer tax preparation services. Instead of having a freely available checklist like H&R Block does on their website, you could package yours up into a simple PDF that your website visitor would receive after the subscribe to your email list. You could have one checklist for personal taxes and one checklist for small business taxes. This would allow you to follow up with them after they download the checklist to see if they are in need of your services and specifically cater your follow up for personal or small business needs. In the off chance that the person or business did not need your help this year, they will hopefully stay on board your list and follow the valuable content you send out, so that when the next year rolls around, they might be interested. When you are selling your products or services to a client, do you use specific data to do it? Can you package that data up in an appealing way? If you can, offer it up as a free report for your visitors to get them on your email list. Ideally, it will be data that will lead them to be more interested in your products or services. Chances are, you will see people offer up longer pieces of content, such as free ebooks, free whitepapers, and similar as lead magnets. While those are great, the shorter your lead magnet, the better. Why? Because unless you are a content-publisher only, the goal of your lead magnet is not only to get people on your email list, but also to become your customer. If they decide that they’re going to take the time to go through your ebook, they might never go through it at all. And thus, they might never become a customer at all. You want them to have something they can use immediately, like the discount code, which can be applicable to any business that sells anything online, whether it’s a physical or digital product or service. You want them to have something they can put to use immediately, like a checklist. Or, you want them to have something they can consume quickly, like a one to two page report. These three things are the types of lead magnets that turn people from visitors into leads quickly and efficiently, and they are the types of lead magnets that expedite the process of pushing them further through your sales funnel.